"The identification of molecules by sensing their unique absorption resonances is very important for environmental monitoring, industrial process control and military applications," said team leader Daniel Wasserman, a professor of electrical and computer engineering. Wasserman is also a part of the Micro and Nano Technology Laboratory at Illinois. The food and pharmaceutical industries use light to detect contaminants and to ensure quality. The light interacts with the bonds in the molecules, which resonate at particular frequencies, giving each molecule a "spectral fingerprint." Many molecules and materials more strongly resonate in the IR end of the spectrum, which has very long wavelengths of light – often larger than the molecules themselves. "The absorption signatures of some of the molecules of interest for these applications can be quite weak, and as we move to nano-scale materials, it can be very difficult to see absorption from volumes smaller than the wavelength of light," Wasserman said. "It is here that our antenna array surfaces could have a significant impact." Other nano-scale antenna systems cannot be tuned to a longer light wavelength because of the limitations of traditional nanoantenna materials. The Illinois team used highly doped semiconductors, grown by a technique called molecular beam epitaxy that is used to make IR lasers and detectors. "We have shown that nanostructures fabricated from highly doped semiconductors act as antennas in the infrared," said Stephanie Law, a postdoctoral researcher at Illinois and the lead author of the work. "The antennas concentrate this very long wavelength light into ultra-subwavelength volumes, and can be used to sense molecules with very weak absorption resonances." The semiconductor antenna arrays allow long-wavelength light to strongly interact with nano-scale samples, so the arrays could enhance the detection of small volumes of materials with a standard IR spectrometer – already a commonplace piece of equipment in many industrial and research labs. The researchers further demonstrated their ability to control the position and strength of the antenna resonance by adjusting the nanoantenna dimensions and the semiconductor material properties. The group will continue to explore new shapes and structures to further enhance light-matter interaction at very small scales and to potentially integrate these materials with other sensing systems. 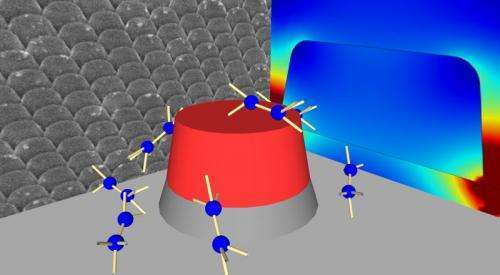 "We are looking to integrate these antenna structures with optoelectronic devices to make more efficient, smaller, optoelectronic components for sensing and security applications," Wasserman said. The paper is titled "All-Semiconductor Plasmonic Nanoantennas for Infrared Sensing."